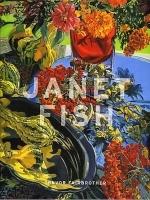 Janet Fish’s new paintings invigorate the still life form through a celebration of the beauty of everyday objects. Precisely arranged and executed in energetic strokes of intensely colored paint, Fish’s work delights the eye and challenges the mind. A color catalogue is available with an essay by curator and critic Trevor Fairbrother. "Fish has a boundless curiosity about light," Fairbrother writes in the catalogue essay. "The perception of its behavior lies at the heart of her work. She knows that light is a form of energy and, as such, it can never be still. When she is making a picture she is marveling at the rousing, life-giving actions of light." Many of Fish’s paintings function as a visual diary. Gifts from friends, or their admired and borrowed belongings, are featured in paintings such as Bob's Bowl / Red Berries. Since the 1980s Fish has spent an increasing amount of time each year in rural Vermont and the landscape of the state figures prominently in a number of her paintings. Flowers grown in Fish’s garden enliven most of the paintings, in either primary or supporting roles. Some of Fish’s smaller paintings almost seem to serve as “portraits” of the individual object or small groups of objects depicted. Fish begins by setting up a still life arrangement. Rather than selecting things for their symbolic meanings, she works intuitively, gathering objects that “seem right together” and allowing a theme to emerge from the assemblage itself. Because her canvases can take up to a month or more to complete, each is carefully planned to allow for a fluid situation that is open and rich in possibilities. The paintings grow and change in time and become a record of responses to what has been seen and experienced in the process of painting. Fish attributes her fascination with light and intense color to having grown up amid the dazzling brightness and vibrant tropical colors of Bermuda. An artistic family also contributed to Fish’s early interest in art: her grandfather was Clark Voorhees, the American Impressionist; her mother and uncle were sculptors; and her father occasionally taught Art History. She attended Smith College, where she received a B.A., before earning a Master’s Degree in Fine Art from Yale in 1963. After graduation Fish moved to New York City. Her paintings of the late 1960s and early 1970s showed groups of glass objects, transparent containers filled with liquids and fruits covered in supermarket cellophane. The imagery tapped into Pop Art concepts while the vigorous brushstrokes displayed a debt to Abstract Expressionism. Fish says of this period, “I worked in a reductive way, eliminating everything that I was not interested in, and constructing paintings out of what interested me.” From the beginning, Fish adapted commonplace objects to her painterly concerns, insisting that the subject matter was relatively unimportant, and that meaning came from tone, gesture, color, light, scale and composition. The real subject was the nature and substance of light, with meaning coming from tone, gesture, color, light, scale and composition. "The brushwork in Fish’s paintings is variable, for, like light, it forms and embellishes the elements of her compositions," Trevor Fairbrother observes. "Fish renders images con gusto, never playing down the physicality of her paint or the movements of her brush. She is not finicky in this regard, and has often declared an interest in painting that is tough, brash, and raw. Fish is deliberate in her stroke-by-stroke construction of an image. The color, scale, movement, and directional flow of the brush marks contribute to the visual success of the entire composition." Since 1978, Fish has spent half the year in New York and half in the Green Mountains of Vermont. The shift to Vermont coincided with the incorporation of still life, human figures and landscape into increasingly complex scenes in which color, light, and shadow are masterfully handled. Over the past two and a half decades, Fish has gradually opened up the backgrounds of her paintings and introduced more color, detail and complexity.